Diaghilev and Stravinsky were next to each other. At Diaghilev's tomb a similar process of appropriation was in operation. Pens had been left at the poet Joseph Brodsky's grave; here, people had left ballet shoes. There were three in total, three halves of three pairs, two left and one right. Lots of messages too. Stravinsky's tomb was bare. No one had left a violin or piano or anything. Isola di San Michele described in Geoff Dyer's novel Jeff in Venice, Death in Varanasi. 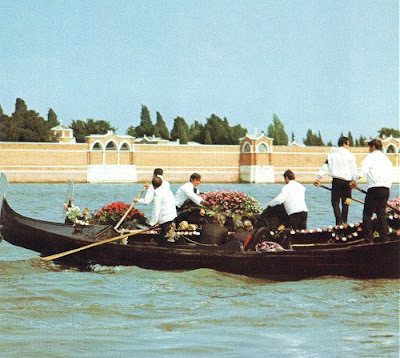 Photo shows Stravinsky's funeral cortege approaching San Michele, April 15, 1971. No one left a violin or piano, but in Paris someone left a cello. Please notice that the name of the poet is Joseph Brodsky, not Jacob.